Construction of fiberglass tubs and showers uses methods and materials similar to those for building fiberglass boats. Gelcoat is applied to a mold and allowed to cure. Then chopped fiberglass and polyester resin are applied over the gelcoat and worked into the surface. To create a stiff and strong fiberglass tub or shower enclosure, the laminator uses a grooved roller to compact the fibers against the gelcoat. The quality and strength of the laminate depends on the operator’s ability to apply the appropriate amount of fiberglass and resin in critical areas. If enough material is not applied or the laminate is under-engineered, cracks can develop over time, usually in the bottom of the tub or shower. Stress cracks are often shallow and cosmetic and usually do not require structural repair. Other times, cracks extend deeper into the laminate and can lead to a leak in the shower or tub. When this happens, you have several options. One, obviously, is to replace the unit with a new fiberglass tub or shower. However, most tub and shower units are not designed to be removed. They are installed before wallboard, tile and flooring, and often before all of the walls are framed. So replacing the unit can be a messy, expensive proposition. You might as well remodel the whole bathroom while you’re at it. Another option is to call a specialist in tub and shower repair for an estimate. Such specialists can repair the cracks and make everything look as good as new, but they may be costly. A third option is to repair the tub or shower yourself. 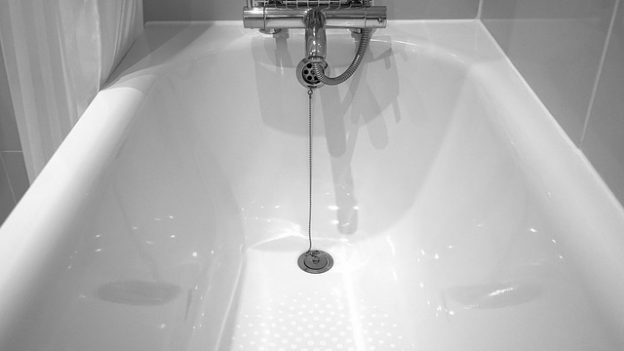 If you plan to do your own fiberglass tub or shower repair, begin by determining the location and extent of damage. Next, see if repair is possible from the back. Don’t rule out cutting a hole through the subfloor under the damaged area of the tub from the basement or from the room below if the leak has already destroyed the ceiling. While structurally the fiberglass repair can be done equally well from either side of the tub, repairing from the back minimizes the cosmetic repairs required. It is the cosmetic work after the structural repair is completed that is most demanding and time-consuming. You can often reinforce the bottom of a fiberglass tub or shower from the underside while sealing the cracks. Clean the back and abrade it with sandpaper to prepare the surface for gluing. Then simply glue on a piece of plywood to the area that is cracked with epoxy thickened with one of the high-density fillers. Wedge the plywood in position until the epoxy cures. Since the plywood is likely to be stronger than the original bottom, it is not necessary to grind 12:1 bevels. In tightly curving areas where plywood will not fit well, you will have to apply layers of fiberglass and epoxy to reinforce the damaged section. However, since this is the back, extensive grinding and fitting are not necessary. Working from the top, gelcoated side, make sure the edges of the crack are even and fair. Apply cellophane tape over the cracks to minimize clean up. Clean up any epoxy that squeezes through cracks to the gelcoated side before it cures. In most cases, having access to the back isn’t possible. Working from the top, you have the choice of 1) making an adequate structural repair with epoxy to seal the leak, without undue concern for cosmetics, or 2) making a professional repair, which includes finishing and matching the gelcoat. The structural repair itself is essentially the same as that described for fixing deep cracks or holes through non-cored laminate in Fiberglass Boat Repair & Maintenance. First, you need to open up the existing cracks and breaks to create more surface area for the repair to adhere to. To do this, machine a shallow bevel or slope along both edges of each break. You can use a 4″ angle grinder, a disk sander attachment on a portable drill, or a Dremel™ rotary tool or similar tool fitted with the appropriate coarse (36 or 40-grit) abrasive. Protect yourself and the surrounding areas from fiberglass dust. Be sure to wear gloves, a dust mask and goggles while grinding. Fiberglass dust can be very irritating. Keep a shop vac close by. If your bathroom is equipped with a blower vent, turn it on before you start. Start the bevel at the edge of the break and extend it out a distance of 12 times the laminate thickness. For example, a 1/8″ thick laminate should have a 1½” wide bevel on each side of the break, with a knife-edge at the bottom of the laminate along both broken edges. Before applying epoxy, sand the area again, this time by hand with fresh 80-grit sandpaper. Vacuum up the dust. Solvent wipe downs are not recommended. Next, tape off the surrounding areas with plastic packaging tape, electricians tape or duct tape in combination with a plastic drop cloth to minimize cleanup later. Cut pieces of fiberglass cloth to create progressively narrower layers that will fill the ground out beveled area you created. Do your best to match fiberglass buildup to the original laminate thickness. 9 oz fiberglass cloth works well for this type of repair. It can be purchased in 2″ to 4″ wide tapes from many of the stores that sell our epoxy. A 1/8″ thick laminate will require 4 to 5 layers of 9 oz fiberglass to fill the bevel. See the chart to gauge the number of layers required to equal your laminate thickness. * Average of multiple layers applied by hand lay-up. Use WEST SYSTEM® 105 Resin and 205 Fast Hardener to wet out the beveled areas prior to placing the first layer of fiberglass. Wet out the largest piece of fiberglass first and place it in position. Then repeat with progressively smaller pieces, wetting out and placing each layer one at a time, until the bevel is filled (see illustration, below). You can either let this cure overnight, then wash with water and sand the surface before applying more epoxy, or you can proceed after allowing the epoxy to cure until it is tacky. You can use a heat gun to speed the cure, but make sure to provide adequate ventilation. Next, apply epoxy to fill the weave and smooth the surface of the repair. The epoxy can be modified for color and viscosity. Adding 406 Colloidal Silica Adhesive Filler will create a basic white thickened epoxy that can be used as a body filler. It will be difficult to sand when cured, but will not need to be sealed before it can be painted. It can also be left as is if the color match is close enough to meet your needs. If the color is not close enough, you will now need to deal with the cosmetic side of the repair. Color matching and duplicating the gloss or texture of the original finish are the challenges. Gelcoat, pigmented epoxy, and paint offer three possible approaches to consider. Repairing gelcoated fiberglass tub and shower assemblies with polyester gelcoat is probably the best way to achieve professional results. Unfortunately, this is not a viable option for most home repairers because gelcoat repair normally involves spray equipment and nasty fumes and safety issues. It is also helpful to have previous experience applying gelcoat and matching subtle shades of color. If you are interested, there is an excellent procedure for applying gelcoat over epoxy repairs in our Fiberglass Boat Repair & Maintenance, Section 15.3 Gelcoat Finishes. You can make your own epoxy gelcoat from WEST SYSTEM epoxy, acrylic paint pigment, and color additives. These offer several advantages. They have low odor compared to solvented paints, they can be applied as a finish coat the same day as the structural repair, and they can be wet sanded and buffed after they have cured overnight if you desire a smooth shiny surface. While repairing my molded shower stall base, I had planned to add 501 White Pigment to the epoxy and adjust the color with acrylic paint pigments until I achieved the desired color. I was lucky because I only had to add the white pigment to 105 Resin and 205 Hardener (the hardener had turned slightly red) to create a perfect match to the off-white gelcoat—an occurrence unlikely to be repeated. In addition to acrylic paint pigments, you can use fillers and additives to modify the color of epoxy. For example, 423 Graphite Powder makes black; 420 Aluminum Powder makes gray; 410 Microlight makes beige or almond, and 405 Filleting Blend makes brown. Paint offers most people a better opportunity for matching color. Get a color chart from the paint store to compare against your tub or shower. Some people don’t worry about a perfect match. They neatly tape off and paint the entire bottom of the shower or tub. That way slight color variations are less noticeable. Others tape off and paint a pattern or design on the bottom to cover or conceal the repair area. One of the finest paints we’ve found is Klenk’s Tub and Tile Epoxy Paint™, which is designed to renew existing tub and tile finishes. It is available in white and almond but can be tinted to any pastel color at a professional paint store. It is highly solvented which presents a fire hazard, so use it carefully. Another excellent paint that performed well is Coronado Paint Company’s Industrial Polyamide Epoxy Enamel™. It is available in a variety of colors and can be tinted to match a wide spectrum of colors. It too is highly solvented so ventilation is required. We tried these paints over our epoxy in a variety of surface prep conditions. Both worked extremely well when applied to cured epoxy that had been washed and sanded. They also worked well when applied over partially cured epoxy later the same day. Excellent adhesion was verified the following day and after several days using either method even after exposing the samples to warm/moist conditions for several days. It is worth noting that both paints covered our epoxy very nicely in one coat. Other paints recommended for refinishing a fiberglass tub or shower by the coatings expert at a local paint store were aliphatic urethane paints or polyamide epoxy paints. He felt comfortable recommending these paints over cured epoxy repairs. You can modify both paint types to match an existing color. Aliphatic urethanes and polyamide epoxy paints are two-part systems that usually require an induction period of 15 to 90 minutes after mixing before they can be applied. They are highly solvented and require lots of ventilation to remove flammable fumes. These paints dry over several hours but require several days of additional drying before they can be immersed in water. This entry was posted in Fixing Broken Stuff!, Home repair, restoration & improvement and tagged 19, Epoxyworks #19, Fiberglass, shower, Spring 2002, Tom Pawlak, tub on October 27, 2014 by ewadmin.